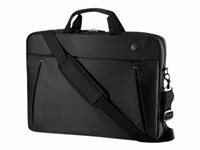 HP Professional Slim Top Load Case lets you store folders and other documents, and features storage areas for business cards, PDAs, cell phones, pens, an AC adapter and any additional items needed for a long stay away from the office or home. Designed for ultra-mobile professionals who are on the road frequently and for long periods of time. The HP Professional Slim Top Load Case is designed to accommodate notebooks with up to a 17.3 inch screen.